Student clubs and organizations allow you to socialize, gain skills and learn about leadership. The Student organizations at College of the Mainland consist of the American Society of Safety Professionals (ASSP), Phi Theta Kappa (PTK, International Honor Society), Pi Kappa Delta (PKD, Debate Team) and the Student Government Association (SGA). The Student Government Association is the governing body for all clubs. You are encouraged to participate in one or more of the following clubs and organizations. For information about joining or starting a new club or organization, contact the Student Life Office at 409-933-8610 or Kari Starz at 409-933-8180. If you are already a member of a club or organization, you may find the resources you need here. ASSP is for students who are planning for careers as safety professionals. It provides additional educational and leadership opportunities for students to learn more about their chosen area of study and to promote interaction between students and professionals in the field of safety. The Art Club provides artistic experiences for all students interested in works of the imagination and the cultures that produce them. The Art Club regularly visits museums, attends lectures and special exhibits, hosts workshops and offers drawing field trips to zoos and libraries. The Automotive Club is a group of car enthusiasts who promote an appreciation for motor vehicles among the students, faculty and staff of College of the Mainland. Membership is open to any COM community member who has an affection for cars, and vehicle ownership isn’t required. The group meets monthly, and plans/participates in activities that focus on furthering group and COM community member’s automotive knowledge. The Business Coalition of the Mainland (BCOM) is an organization for students interested in their own professional development. Our goal as a club is to assist in molding the leaders of tomorrow. BCOM provides resources to members through business related activities. The purpose of College of the Mainland’s Allied Health Club is to provide Allied Health students the opportunity to participate in health-related campus activities, be exposed to a variety of health professionals, enhance career development, get involved in community volunteering and be exposed to a variety of health professions. Our goal is to support Allied Health students with different opportunities to gain or advance their knowledge in the different Allied Health fields. Our club will strive to help students through student shadowing, and providing a variety of professional workshops. The COM Fit Club is for students interested in exercise, health and fitness. It provides an outlet to students who wish to exercise on a regular basis, learn about proper nutrition and become involved in community health events. It is also for those who have an interest in the fields of coaching, exercise science, recreation, personal training, physical therapy and/or nutrition. Find us on Facebook – College of the Mainland Physical Education, Sport and Recreation. The purpose of the Comic Book Club is to discuss, enjoy, and promote comic books, graphic novels, and other related media. The Cosmetology Club encourages leadership and unity among the members. Students work together, have fun and serve people in the community. As a club, students attend hair shows and work together to develop cohesiveness as a group. The purpose of the Gamer’s Union is to promote the essence of competitive gaming, the fundamental belief of good sportsmanship and to enhance our daily lives by incorporating teamwork and leadership through the enjoyment of gaming. Students in this club participate in bi-weekly gaming sessions, hold workshops and organize tournaments. The Hispanic Student Alliance is a successor organization to the Dream Act Leadership Organization due to the legislative changes in the USA. The HSA aims to bring awareness about the Hispanic culture, history and language to the college community through different cultural, educational, social, and political events and activities. 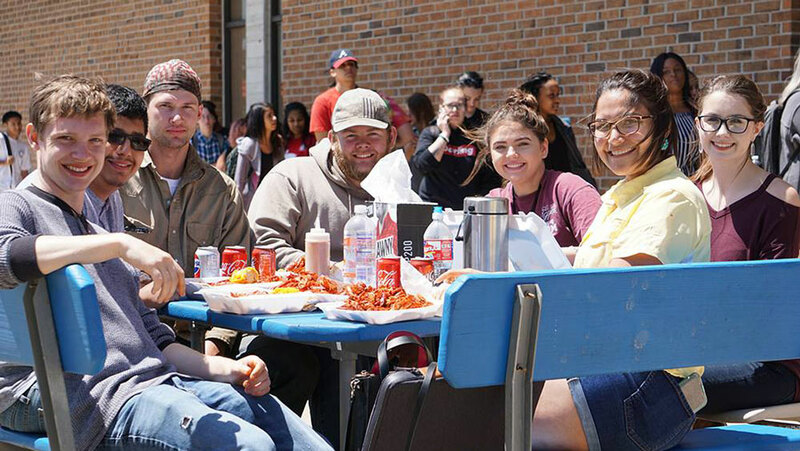 Some of the activities that HSA sponsors include Spanish tutoring, Hispanic film and poetry events, Cinco de Mayo celebration and Hispanic Heritage Month. The HSA also focuses on the recruitment and success of students at College of the Mainland. The history club promotes the understanding and knowledge of history through guest lectures, film showings and field trips. This club also provides opportunities for community service projects that teach leadership skills and social responsibility. The Japanese Culture Club promotes knowledge and interest in all aspects of Japanese culture, particularly anime and literature. This club intends to encourage cultural awareness through discussion; watching films and anime; reading manga or other texts; taking field trips to conventions, festivals or museums (at least one a year); and inviting educational speakers. This club strives to unite LGBT students by encouraging support, building awareness, advocating students and providing a safe environment to discuss LGBT topics. Students are also given opportunities to build leadership and teamwork skills by planning workshops and working on community projects with other clubs. Minority Men for Excellence (MM4E) is a program designed to improve the recruitment and retention of Minorities at the College of the Mainland. Participants receive academic support and character and leadership development through programs and workshops. Men in the program also participate in community engagement opportunities and receive mentoring by faculty, staff and peers. Nu Psi offers community service projects, leadership opportunities and educational field trips for club members. Membership is restricted to current Collegiate High School (CHS) students. The purpose of this organization is to provide the highest level of education for student nurses while aiding in the development of the whole person. Students model integrity and leadership in both their educational activities and their interactions with peers, other healthcare professionals and the public for whom they care. The club abides by and will further the standards of nursing education and influence education legislation, program development and technology use. OAAC was established in 1978 as an organization that provides a venue for members to participate in leadership-skill-building activities and events reflecting life in a diverse society. Community outreach is a major focal point for the organization. Phi Theta Kappa is the official international honor society of community colleges. The purpose of Phi Theta Kappa is to recognize and encourage academic excellence among two-year college students. To achieve this purpose, Phi Theta Kappa provides opportunities for the development of leadership and service, intellectual exchange of ideas and ideals, lively fellowship for the scholars and stimulation of interest in continuing academic excellence. To be eligible, you must complete 12 credit hours at College of the Mainland with a cumulative GPA of 3.5 or higher. You must maintain a GPA of 3.0 or higher after joining the society. Pi Kappa Delta (PKD) is a national honor society that promotes the practice and study of argumentation and debate through on and off-campus activities. Pi Kappa Delta is the oldest national collegiate forensic organization with over 80,000 alumni members. Participation and travel with the debate team in competitions are required for all Pi Kappa Delta members. The PTEC Club strives to create awareness of the career opportunities within the process technology industry. Our group provides support between members to include, but not limited to, academic support (tutoring/peer review), industry tours (as available), career attainment preparation (mock interviewing/resume building) and fundraising, while maintaining academic and legal integrity. The Science Club promotes awareness and appreciation of the natural sciences by providing a better understanding of them through field trips, guest speakers, and other activities. The club sponsors college events and performs outreach through educational and community activities. This club also offers members opportunities to work as a team and assume leadership roles and responsibilities. The Self Defense club is designed to teach basic self-defense and martial arts techniques and principals while building self-confidence, discipline and respect. Members will learn techniques from various styles of martial arts including Muay Thai, Krav Maga, Boxing, Jiu Jitsu, karate, and kick boxing. Members will also learn how to deal with and disarm weapons including edged weapons, clubs, and firearms as well as how to deal with commonly seen self-defense scenarios. The SO Psyched Club promotes interest in and knowledge of psychology and sociology and encourages support between students, faculty, staff and the community. The club provides opportunities such as community service projects, volunteer experiences, guest lectures, film showings, field trips and other activities related to the behavioral sciences. The Student Government Association is made up of an elected body of officers and one representative from each active student club. The role of SGA is to promote student participation in the decision-making process, to serve and to represent the student body. In addition, SGA and the Student Life Department will plan and develop educational, recreational, social, cultural and entertainment programs for the college community. Participants can develop leadership skills and learn to organize special events. Monthly meetings are open to the college community and all credit students are invited to participate. An interdenominational organization open to both Christians and non-Christians, this club invites all who are interested to attend with open hearts and minds. It offers a time to slow down and pray for the campus, world and each other and encourages positive growth and fellowship among students. The veterans’ organization ensures that veterans, active-duty personnel, reservists and their families receive all benefits entitled to them. This organization also provides readjustment resources and provides students and successful alumni a network for professional development. Vision Seekers serves as a unifying club for nontraditional students to fully integrate into the whole experience of college life and culture. Alumni and staff have the opportunity to mentor and tutor students in academics. "Teach what you know!" The Vocational Nursing Student Organization addresses the unique needs of Vocational Nursing students as they transition from the role of a student to the role of a member of the nursing profession. Members have opportunities to participate in service and professional development activities.